From her unique vantage point in New Orleans, Sybil Haydel Morial's life spans one of the most critical periods in our country's history. 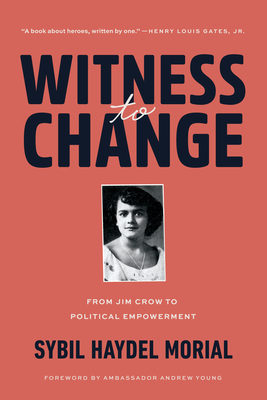 In this remarkable memoir, Morial chronicles her life as both witness to and catalyst for sweeping changes--desegregation, the end of Jim Crow, and the fight for voting rights. These changes transformed the nation during her lifetime. Morial's story is welcome inspiration for the struggle for political empowerment that continues. As Ambassador Andrew Young, a childhood friend and later Sybil's prom date, relates in his foreword: "It is doubtful that New Orleans could have produced two mayors with the dynamic, creative, and visionary leadership of 'Dutch' and Marc Morial without a wife and mother of Sybil's loving strength, intelligence, and moral courage. But the life she lived in the crucible times and her perception of the civil rights movement in New Orleans goes far beyond that." SYBIL HAYDEL MORIAL is an educator, activist, and community leader in New Orleans, Louisiana. The wife of the first African American mayor of New Orleans, Ernest N. "Dutch" Morial, Sybil spent her career in the education field, first as a public school teacher and later as an administrator at Xavier University in New Orleans.